If you can get a SWB rollbar to your location (including freight) for anywhere under $400 you got yourself a good deal. There are substantially more LWB than SWB rollbars out there. Oh, man. You're taking it to the next level. Can't wait to see this progress. I tell my wife that two of them are just piles of parts that just happen to run and drive. I do have a plan. I swear. Alright. It's time to get registrations in and buy tickets for the show for those that haven't already. I have it on my list to do this week. Chime in on this thread to let everyone know you're registered to show your Jeep, as a vendor, just coming for the show, whatever. Also, there's a cookout at my house that Saturday, so I need to know who is coming and we need some volunteers to bring snacks and drinks. I'll have burgers, dogs and more for everyone. Northwest PA - cool! If you're coming to the All Breeds Jeep Show here in York in July (see sticky thread in the Pub) I could have it out by then. I'm hosting a cookout and a bunch of members will be here. A few members are bringing parts, getting vendor booths, etc. PM me a list of what you need and I'll get you a price. It's completely effective, low cost when compared to anything else and way fast. It was rebuilt around 20k miles ago. Where are you located? I've updated my post. I ran through three or four threads and found conflicting info. I concur 100% with this. The top end on the 4.0L develops this type of noise after only a couple thousand miles. I don't really hear anything abnormal in your videos, although the tapping does sound a little louder than usual. Heavier weight oil tends to quiet it down a bit. Media blaster. Bought a 40lb pressurized HF unit to blast a YJ frame clean. I have used it to strip just about everything that needs cleaned and painted. MIG welder. Got it to move the engine mounts on the aformentioned frame. I've used it countless times since on all kinds of stuff around the house. Engine hoist. Bought it to remove an engine. It will also lift a tub off a YJ and will be used when I'm removing the beds from my MJs. Great when moving heavy stuff like axles around the garage. I do all my work myself so it's like having a buddy here with me to help with the heavy lifting. I'm assuming you want to delete/bypass the load sensing valve. Not sure which write up you're reading. Check this out: For your project, it sounds like you want to keep the MJ distribution block. Follow all the steps in the thread linked to here, but keep your MJ distribution block and plug the bottom front port (#1 in your pic), instead of putting in a YJ/XJ/ZJ proportioning valve. Please be aware that if you keep the MJ distribution block, you will be pushing full pressure to the rear wheels. This will increase the probability of locking up the rear wheels when braking hard. Fall 2018 - Winter 2019: A Few Miles, Fuel System Fixed I haven't really done much to Silver Star over the past year. The truck had a nagging fuel system problem where it was not building pressure at the fuel rail. I had already replaced the fuel pump with a Bosch, went through the wiring, relays, etc, and was stumped for a bit. Then I changed the fuel filter and everything has been great since. I've only put a few hundred miles on the truck over the past year, but it's been running great. I've got to get it in the garage in the short term to remove some surface rust and prime/paint those areas. This truck is so solid that I've decided to put build plans on hold while I work on my 92. Silver Star is an excellent driver right now, so I'm going to leave it alone for a bit and use it as a point of reference while tearing into the 92 and rebuilding it. Might be a couple of years before Silver Star goes into the garage to be built and in the interim, I'll post updates here on any changes. Shown above left-to-right: Silver Star 1991 MJ Pioneer; 1995 XJ Limited; Ghost 1992 MJ Base; 1991 MJ Eliminator. The three white vehicles are going to be used in the Ghost build. Starting to develop a storage issue in my driveway. December 2018 - April 2019: Parts Vehicles The intention is to convert this truck to a 4WD automatic, so I've acquired a couple of parts vehicles over the past few months from which parts can be sourced. In December 2019, I picked up is a 1995 Jeep Cherokee Limited 4.0L/AW4/NP-231 with 180K on the clock. The Cherokee is pretty much trashed, but has parts on it I need like good fenders and hood, brackets, etc. It runs strong and shifts very well. I got it for $500, and it does not have a title, so it's going to be used for parts only, then sent to the scrap yard. 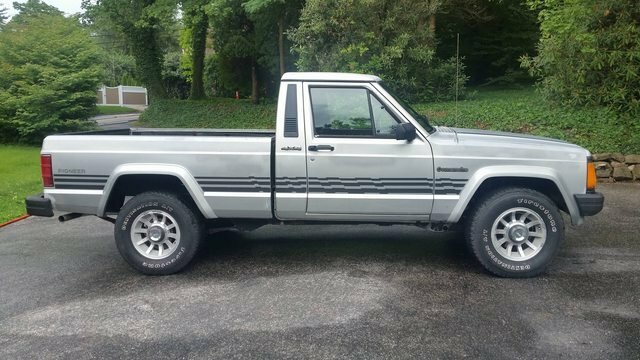 Then, in April 2019, I traveled to Philadelphia, PA and bought a 1991 Jeep Comanche Eliminator 4.0L/AW4/NP-231 with 260K on the clock. The bed on the truck is pristine, which is the main reason I bought it. I bought this truck for $800 from the original owner, and it's got rust on the cab roof, the transmission slips in reverse, it's leaking coolant like a sieve and the vacuum and electrical systems are shot. The engine is new and only has a couple of thousand miles on it. Looks to be a pretty highly optioned HO Eliminator. Perhaps when I'm done building this 92, there will be enough parts left to put the Eliminator back together. I bought it with the title, and registered and tagged it in PA just in case it's more than just a parts truck in the end. I've got to do an inventory, but I believe I have all the parts and pieces I need for Ghost to do the full manual-to-automatic conversion, 4WD conversion, and replace all the dented body panels excluding what's dinged up on the cab itself. I've also collected more black interior pieces over the past couple of months and have a full AMC black interior for the truck now. SO things are looking good - I just have to get a couple of other projects out of the way so I can start on it. Vehicle: 1991 Jeep Comanche Eliminator 4x4 SWB VIN: 1J7FJ66S8ML551555 Engine: 4.0L HO (Chrysler Electronics) Transmission: AW4 Transfer Case: NP-231 Front Axel: Dana 30 3.55 Gears Rear Axel: Dana 35 3.55 Gears Wheelbase: Short Wheel Base / Short Bed Build Date: October 1990 Current Mileage: 260,528 Factory Options: Skid Plate Group, Eliminator Package, AW4 Transmission, Bucket Seats, Full Center Console, Bright White Paint History: Purchased new in 1991 in Philadelphia, PA at Potamkin Auto Group. New engine installed in 2012. After a front end collision in 2013 in Corolla, NC, the truck was towed back to Philadelphia where it remained parked. Sold to me in April 2019, moved to York, PA. The cab roof has substantial rust, the front end needs collision work, and overall the electrial, vacuum and cooling systems are shot. The AW4 transmission slips in reverse, and overall the truck needs a lot of work to get back to what it once was. It does start and move under it's own power. This is solved. By reverse engineering the links @Pete M and @gogmorgo posted, we were able to find an old conversion table in the database that mapped old topic ids from the old PunBB software to new topic ids used by IPB, which was upgraded to on August 20, 2012. This mapping was then verified against the test cases in this thread, and proved true: http://www.comancheclub.com/forums/viewtopic.php?f=3&t=17030 https://comancheclub.com/topic/16070-im-building-another-trailer/ https://comancheclub.com/forums/viewtopic.php?t=78 https://comancheclub.com/topic/67-my-lift-pix/ https://comancheclub.com/forums/viewtopic.php?t=110 https://comancheclub.com/topic/95-won't-start/ http://www.comancheclub.com/forums/viewtopic.php?f=7&t=26095 https://comancheclub.com/topic/24491-the-dailyest-of-drivers-1992-mj/ So we created a conversion script at /forums/viewtopic.php which uses the database to look up the id mapping, then redirect to the proper URL using the new format (which is topic id dash seo title). All the help is appreciated. Without people posting up what they thought were matches, we would not have discovered the mapping data was available. I'll post an example. I ran across one when I bought my 92. Here is an ad terrawombat posted years before he sold it to me: https://comancheclub.com/topic/50575-1992-jeep-comanche-sport-2wd-md/ In that thread, he says there's more info in his build thread and posted a link to this URL, which does not work (Not Found): http://www.comancheclub.com/forums/viewtopic.php?f=7&t=26095 The only build thread for this 92 I could find authored by terrawombat is at this URL, so I assume this is the URL that the above should be directed to: https://comancheclub.com/topic/24491-the-dailyest-of-drivers-1992-mj/ I see the same correlation as if post #26095 became post #24491 during the forum upgrade years ago. I'm going to do some digging in the database itself, but need more examples, please. Here in PA when one comes available, which is about once every two months, they are usually in this condition or slightly better and going for $1,500-2,000. Whenever one appears that's not rotten and can be driven, they usually go for $5,000-7,000. I did some digging on this. There were two silver colors first offered in 1991 and used again in 1992 on MJs. The first is Silver Star Metallic code PAC (aka KAC), which can be seen here on my truck, although yours looks way better. Definitely appears darker or lighter depending on the light available: The second is Dark Silver Metallic code PS7 (aka KS7), which can be seen on HOrnbrod's truck: Thanks, looking good. Welcome to the High Output Brotherhood. My house is wired properly. Every time wiring had been added or modified, it was done by a certified electrician and/or myself to adhere to code. The code at the time of modification dating all the way back to 1956 when the house was built. No way it stands up to 2019 code. Would pass home inspection, though. I was kind of taken back by what you said here, but you're right. I like the quick and dirty solution you propose here. For the extension, some people buy RV hookups and hack them instead of buying all that copper straight up.